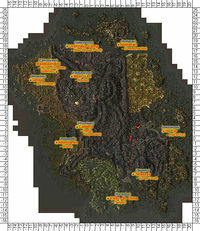 The ten Propylon Indices allow you to travel instantly via the Propylon Chambers at the ten Dunmer Strongholds around Vvardenfell. In order to travel to a location, you must have the Index for that destination. They all weigh 2.0, and are worth 500 gold each, unless the official Master Index plugin is installed, when the Valenvaryon Propylon Index is revalued to 25 gold. The plugin allows you to have the individual indices combined into a Master Propylon Index, and use the Caldera Mage's Guild as a travel hub to the Propylon Chambers. Hlormaren, Dome The Hlormaren Stronghold is west of Balmora, near the coast. The index is in a dome on the roof of the fort. The index is on the middle shelf on your left as you enter the dome, on the right half, near a flask, a bottle and a bowl. Gnisis, Arvs-Drelen Arvs-Drelen is in Gnisis, in the northern area. The index is in the top room of Arvs-Drelen, on the top shelf next to Baladas Demnevanni between the Cyrodiilic Brandy and the book "2920, Rain's Hand". It can be difficult to see, so you'll need to look carefully. Baladas does not own it. Maar Gan, Shrine The index is in a shrine in the southeastern part of Maar Gan. The index is on a silver plate next to the big rock when you enter the shrine. Salen Ravel is the index's owner. If the Master Index official plugin is installed, he will sell it to you. Otherwise, you'll have to find a way to steal it if you want it. Maelkashishi, Shrine, Forgotten Galleries This Daedric shrine is a little way west from Maar Gan on the other side of the mountain range. The index is on a scroll next to a skeleton at the very top of the Forgotten Galleries section (levitation needed). Caldera, Irgola: Pawnbroker Irgola's shop is in Caldera. Irgola runs a shop between Falanaamo the clothier('s shop) and Verick Gemain the trader('s shop). The index is on the window sill next to Irgola. Irgola owns and will barter the index. Tel Fyr, Hall of Fyr Tel Fyr's tower is on an island southwest of Sadrith Mora. The index is in the top of the tower, on the table next to Divayth Fyr. Fyr does not own the index. Vivec, St. Olms Temple The Temple in the St. Olms district of Vivec is reached via the Plaza level. The index is on the floor next to some crates, downstairs in the northwest storage room. Rotheran, Communal Hut The Rotheran Stronghold is south of Dagon Fel, on the southern coast of the island. Rols Ienith is just inside the communal hut and must be pickpocketed or killed for you to obtain the index. Telasero, Lower Level This stronghold can be found east of Suran (west of Molag Mar). The index can be found in one of the casks in the middle of the Lower Level together with other items. Urshilaku Camp, Wise Woman's Yurt The Urshilaku camp is along the coast east of Khuul. The index is on a table at the back of the Wise Woman's Yurt. The Wise Woman, Nibani Maesa, owns the index and will barter it if the official Master Index plugin is installed. If it is not, you must steal the index. 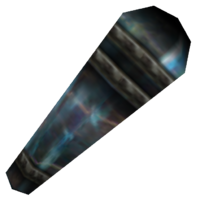 The Master Propylon Index is an artifact created by Folms Mirel in Caldera, in return for gathering all ten original other Propylon Indices. You can use it to teleport directly to the Caldera Mages Guild from any working propylon chamber. Folms can then send you to any of the other chambers, for free. It is not necessary to have the Master Index in your possession to use his services. This item is added by the Master Index official plugin. One advantage to using the original indices is that they provide a quick means of transport across Vvardenfell during the Silent Pilgrimage quest. However, with the Master Propylon Index, you will only be able to get as far as Caldera, since you cannot talk to Mirel without failing the quest. Another factor to consider is that Mirel will take each index from you when you return from the quest to get it, before revealing the location of the next, so you cannot use a partial set of them while following his quests. It may be more convenient to find most or all of them on your own, then approach him about the topic when you have them (or cannot find one) and have long been using several of them. This page was last modified on 19 October 2018, at 21:16.